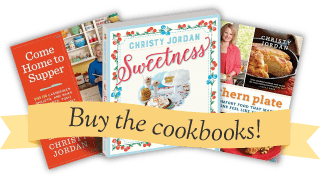 In this post learn how to make this delicious oven fried chicken with only three ingredients – and find out what foods I can’t be left alone with! We are finally stepping in line with the rest of America and eating more chicken than beef, although our reasoning might be a little different than others. Our daughter, Katy, just likes chicken better. 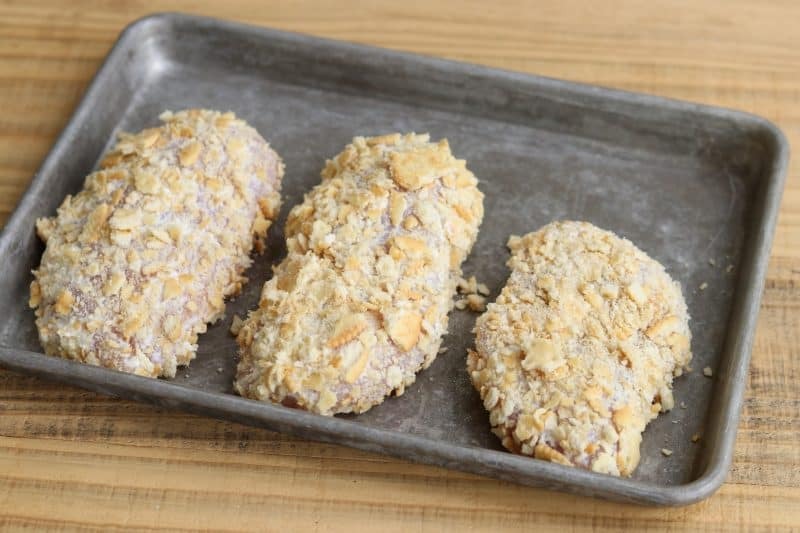 Even though we have countless chicken recipes, I’m always looking to throw something new into the mix so a few weeks ago I decided to oven fry some chicken with crushed Ritz crackers as the breading because, who doesn’t love a Ritz cracker? In fact, I never buy them because they are just too good and I can’t be left alone in the house with them. Same goes for pretzels (I like Rold Gold) and a good quality saltine cracker (Premium Crackers, get thee behind me!). You’ll only see them in my house if I need them for a recipe because if I bring them in for any other reason they’ll be gone in the blink of an eye and I am always the guilty party! Do you have any foods you just avoid buying like that? I’d love to hear about them in the comments! So back to this chicken. I wanted a wet layer that added tenderness to the meat, kept the cracker crumbs in place, and enhanced the flavor. I decided to go with sour cream and it did not disappoint. This is a simple three ingredient recipe (one being chicken) and has already made it on the menu twice since I tried it out the first time. I think your people will love it, too. To make this you’ll need: Sour Cream, Ritz Crackers (I used one sleeve for three pretty good sized chicken breasts), and boneless skinless chicken breasts. Place sour cream in shallow bowl or plate. Pat chicken dry with a paper towel and roll in sour cream mixture. You’ll be surprised at how well it coats! Roll each chicken breast in cracker crumbs. Place on baking sheet and put in oven. Bake for 30 minutes, flip, and bake 20-30 minutes more, until lightly browned. If you’d like them a little browner you can give a quick light spray of cooking spray on them, it just takes a tiny bit. 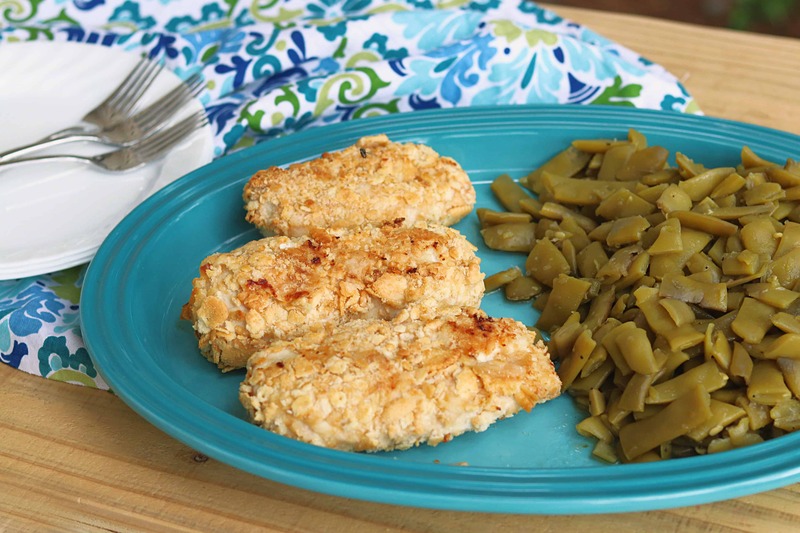 This is a quick and easy simple meal for us so I just serve it with green beans. I usually have some in the freezer that I’ve cooked, or I use the recipe for Last Minute Green Beans. So give me the low down! What foods do you try not to buy because you know you’ll eat them all up? Place sour cream in shallow bowl or plate. Pat chicken dry with a paper towel and roll in sour cream mixture. You'll be surprised at how well it coats! Place on baking sheet and put in oven. Bake for 30 minutes, flip, and bake 20-30 minutes more, until lightly browned. If you'd like them a little browner you can give a quick light spray of cooking spray on them, it just takes a tiny bit. I make a version of this with some garlic powder added to the cracker crumbs and dipped in egg rather than the sour cream. And I put a few pats of butter on top. One time my brother asked me to please take the platter off the table so he would stop eating it so that’s generally a sign it’s pretty tasty. I baked chicken tenders last night, brushed them with mayonnaise & rolled in crushed pork skins. to make them low carb. My husband loved them and he is not even on a low carb diet!!!! Don’t you just love it when that happens!? Makes it so much easier to cook! I altered the recipe. I used all seasoned salt & the sour cream & seasoned bread crumbs, then baked it in my air fryer. Served with mashed potatoes, green beans & fresh tomatoes. It was great! Thank you for the idea! Have none of you tried substituting Greek yogurt for sour cream?! It’s supposed to be more healthful plus mixes with berries & cereal. I love it straight out of the carton. I don’t use my regular oven much in the summer but have a good toaster/convection oven. What would the baking time be for a toaster oven. Thanks! Hey Susan! I’ve only made this in my regular oven but toaster ovens should have the same temperature settings and therefore the same time for cooking 🙂 Hope you get to make it soon! Christy, if I might reply to this query. I have baked this in my toaster/convection oven and I use the same temperature as used in the regular oven and with great results. I can’t bring milk chocolate chips in the house unless I immediately use them in a recipe. If not, we eat them as dessert and they are gone in a flash! My daughter is the same way! lol When she was little I would often open up the pantry and see a little trail of chips and the corner torn off a bag of chocolate chips. I’m the same as a previous commenter, chocolate chips are my nemesis! Love this chicken idea and will be trying soon. We make an entree for the kids by cutting the chicken breasts into smaller pieces and covering with mayo, some Parmesan cheese and then panko bread crumbs. Always looking for easy, chicken dishes. I also use your recipe. The sour cream is something different. I’ve made the same recipe but substituted the sour cream with a Dijon mustard/mayo combo with delicious results! Ice cream is not safe in my house, no matter the temperature outside, love ice cream. Ice cream WAS my favorite food until I met Talenti’s Gelato. Neither of these can reside in my home…even if I store them in the garage freezer! Also, Frito’s cannot inhabit my pantry. They can only be bought on the way to a football party (because they go with the dip) and will stay there! Rold Gold pretzels here, too. Also, Oreo cookies and good ol’ regular Lays potato chips. Can’t quit them when I get to eating them! I’m a sucker for some of that queso cheese in a jar. Once the jar is opened it’s like a fight to the death to see who goes first-the tortilla chips or the cheese? It’s always the cheese, I don’t know why I even bother with the tortilla chips! I only use the chips because of the looks I’d get walking around my house with a straw in the queso jar like it was a cocktail. Maybe if I added a paper umbrella….? LOL, I think that is a grand idea! This looks delicious – I love anything with a Ritz cracker. It’s potato chips and popcorn that are not welcome here. I can’t stop! I hope you get the opportunity to try it soon Katie!!! For us, it’s the Wal-Mart brand of (Girl Scout) Tagalongs! We love them much better than the real thing and they’re cheap too. But that’s a dangerous combination. They’re even better after being in the fridge a day or two. I saw those the last time I was at Walmart! My family’s already addicted to the Walmart Samoas and Thin Mints! They also have their own kind of pecan sandies which taste as good as the main brand! I wonder if Walmart has a version of Do-si-dos or Trefoils? I can’t bring Ritz crackers in the house! Lol! I could eat a whole sleeve by myself. I only buy Ritz crackers if I need them for a recipe. If I have leftover crackers, I make pimento cheese and take it to work (along with Ritz) or I give it to my husband, and he takes it to his office. Your chicken recipe looks wonderful! Thank you Gina, I hope you get the chance to try it soon!! Thanks for the recipe, Christy – it sounds delicious! I can’t buy the Wal-Mart brand cheetos or Lay’s Potato Chips. Both are so addicting!! Great idea Ramona, thank you so much for sharing your tips!! Love you and all you do. I can’t be left alone with almost any kind of Little Debbie cakes. But honey buns are lethal. When this old woman started buying them they were 49 cents a box. I miss y’all. Congratulations to Brady! Hey Patsy!! Thank you so much, miss you as well!! Stauffers Animal Crackers (cookies to us) have a very short “shelf life” at our house. My husband and I are both addicted to them and want to eat them like potato chips! is it all animal crackers or just that particular brand? LOL, I definitely think you are on to something there Alicia!! They are devishly delicious!! Lorna Doones and Banana Bread are not safe in my house! I only eat Lorna Doones when they give them to me at the Blood Bank. Am going to try this chicken dish this week. Thanks for all you do! Lorna Doones are addictive!! Hope you are well Jane, thank YOU for all you do!! This chicken IS really good and so simple to make. My late friend gave me this recipe many years ago, but she used crushed Cheez-Its crackers and melted some butter in the pan and then put the sour cream and Cheez-It rolled chicken in the pan on top of the melted butter. I know the butter adds more calories, but it surely tastes great. Thank you for sharing this recipe, now I’ll have to make this again! Great recipe Christy. Thanks for all you do. I used to not be able to leave pork rinds alone. Ohhh goodness, Coconut cake is a hard one to pass up!!! Looks like a great recipe although I’ll have to find a substitute for the sour cream. I love Ritz crackers and chicken so this is a must try. I understand Linda!! It is addictive. I am so glad you are enjoying the recipe!! What an easy recipe!!! Wondering if it could be done with chicken tenders? Thank you so much for all of your great recipes, Christy!! Absolutely! They would probably get done sooner but it will work perfectly with tenders. Thank you, Barb! I made this for dinner tonight, but sprinkled the chicken breasts with salt and garlic powder before doing the sour cream and crackers. It turned out nice and crispy and moist on the inside, but I couldn’t flip the chicken. The crumbs got all soggy on the bottom and completely stuck to the pan, even though it was lined with foil and greased. Next time I will just put the cracker crumbs on the top and sides of the chicken and will sprinkle some more seasonings on the chicken first. All in all, a solid and easy recipe! Thank you! Great use for leftover sour cream, too!